Asparagus. What is there to say about these green pencil looking vegetables that are so wonderfully flavourful and have a multitude of recipe uses? I guess I just said something about them now didn’t I? My family isn’t much into the whole asparagus as a side dish or asparagus in general with the exception of P who seems to eat absolutely anything put in front of him. We are constantly trying new recipes and ideas that include these incredibly earthy flavored veggies. These Prosciutto Wrapped Parmesan Asparagus have become a huge hit in our house and it’s time we shared this with all of you. The title itself gives away all the main components in these amazing Prosciutto Wrapped Parmesan Asparagus and with such a diverse flavor profile that comes from this recipe, even the pickiest of eaters will be begging for just one more spear like you’ve always wanted your picky one to eat. 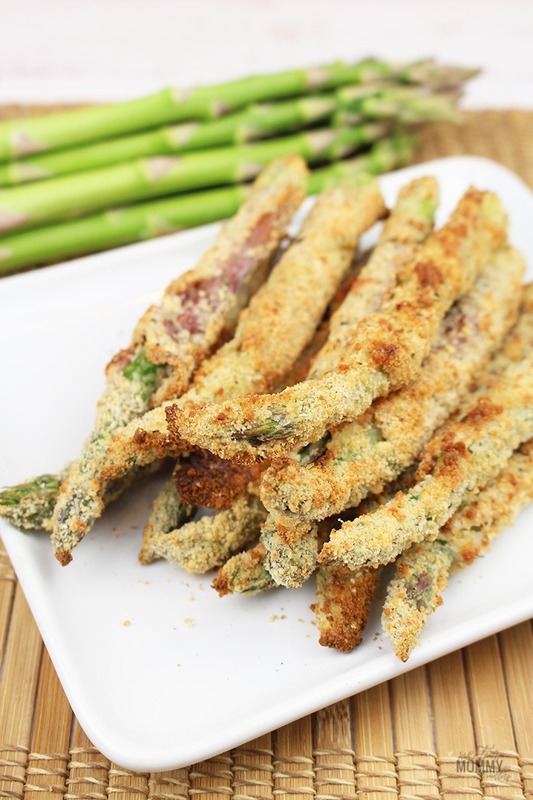 I was so surprised at how quickly the kids actually ate these and had no idea that Asparagus could be such a kid-friendly menu item, but, here we are. 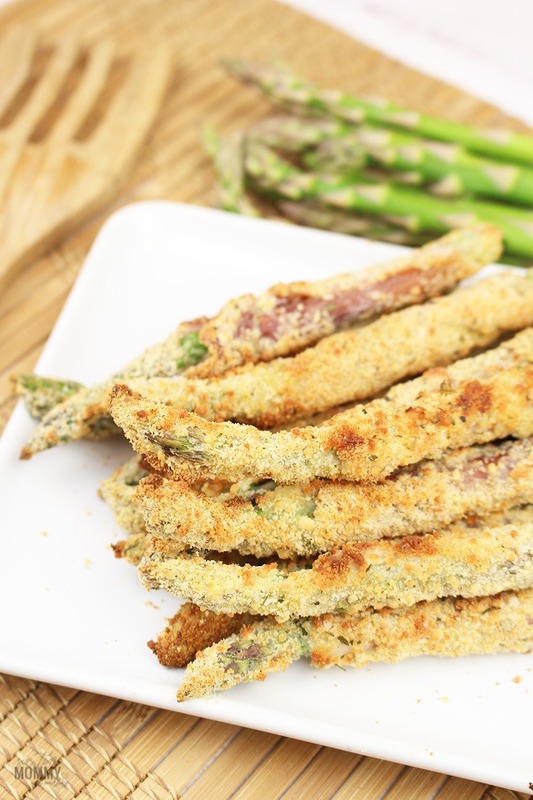 The kids have often asked for these Prosciutto Wrapped Parmesan Asparagus to be made over and over again since the inception of this recipe and P has gladly entertained their requests. Again, he eats just about anything! With 8 kids and counting, we were thrilled when all the kids with the exception of Jordan and of course Mia (who is only 11 mos.) 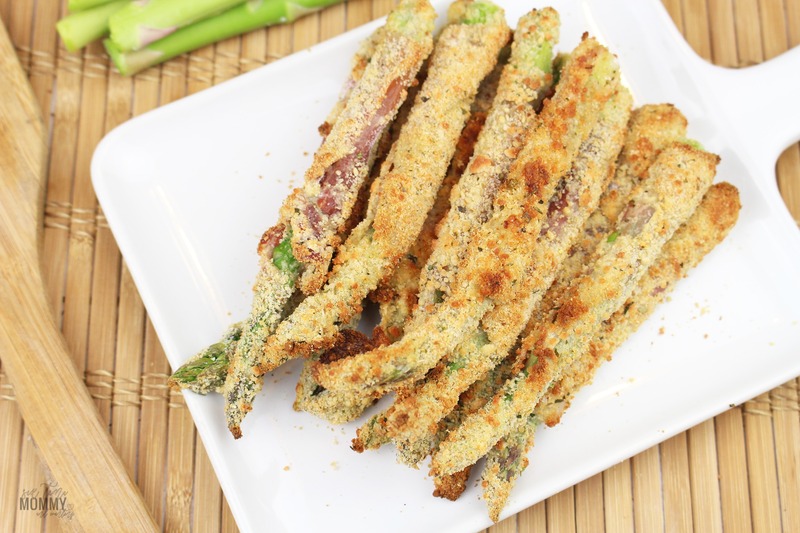 left but a trail of Parmesan crumbs in the wake of scarfing these delightful tidbits of Asparagus heaven. 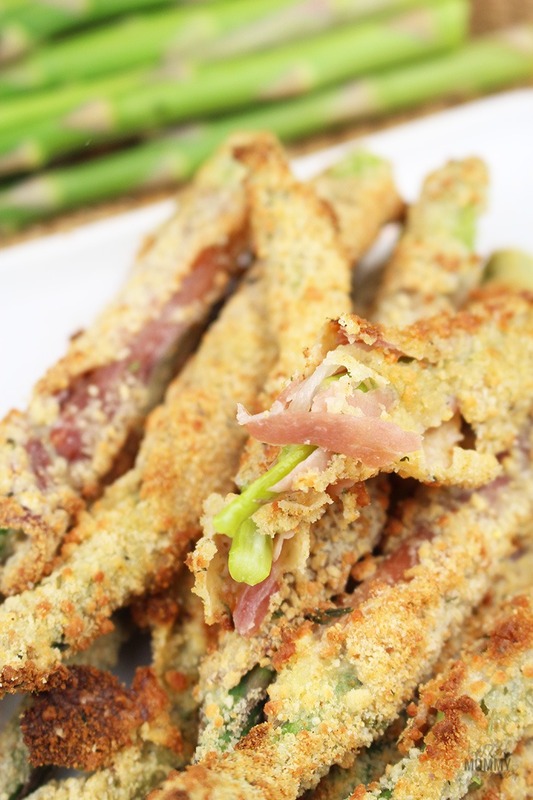 Easy enough for the kids to roll up their sleeves and help out, these Prosciutto Wrapped Parmesan Asparagus will keep your kids and others wanting just one more bite too. In a medium bowl gently whisk your egg. In another bowl, add your Parmesan, bread crumbs, garlic, and cayenne and mix well. Wash and pat dry your Asparagus and cut off the bottoms of the spear about 2 “. In a medium pot, boil some water and blanch the Asparagus. Once blanched, run Asparagus under cold water and again pat dry. Take a strip of your prosciutto and gently wrap the Asparagus use 2 if necessary. 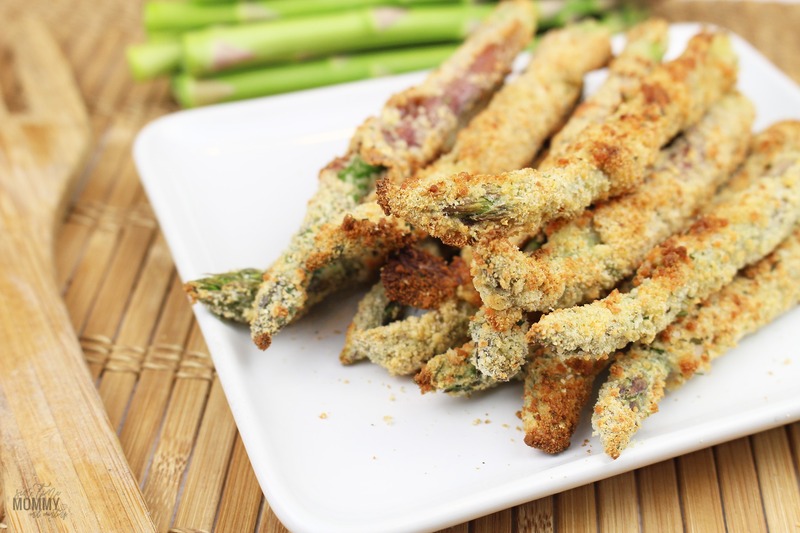 Dip the wrapped asparagus in the egg then carefully roll the spears in your parmesan mixture. Place spears about an inch apart on a parchment lined baking sheet until ready to air fry. Carefully place your spears into air fryer and cook for 8-10 mins. 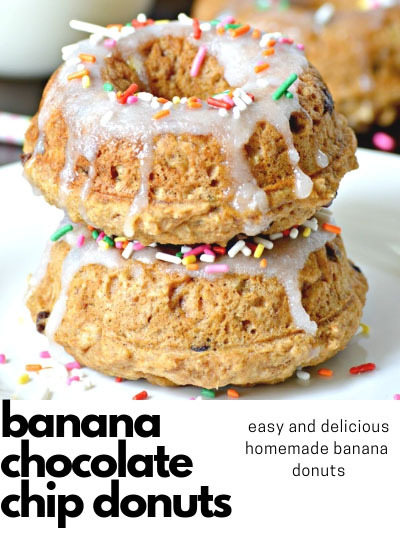 I must tell you, I am ever the skeptic when P gets crazy ideas like this but at the end of the day, these were so tasty that even I had to keep going back for more and that says a lot as veggies and I are mortal enemies. 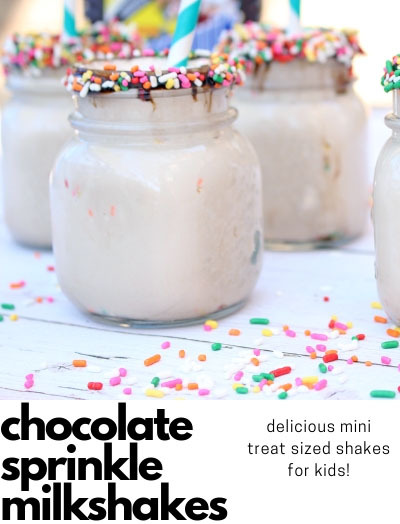 What a great addition for snack time, school lunches or just about anytime that you can think of. Would your kids go crazy over these Kid Friendly Prosciutto Wrapped Parmesan Asparagus like ours did or would you even bother sharing?